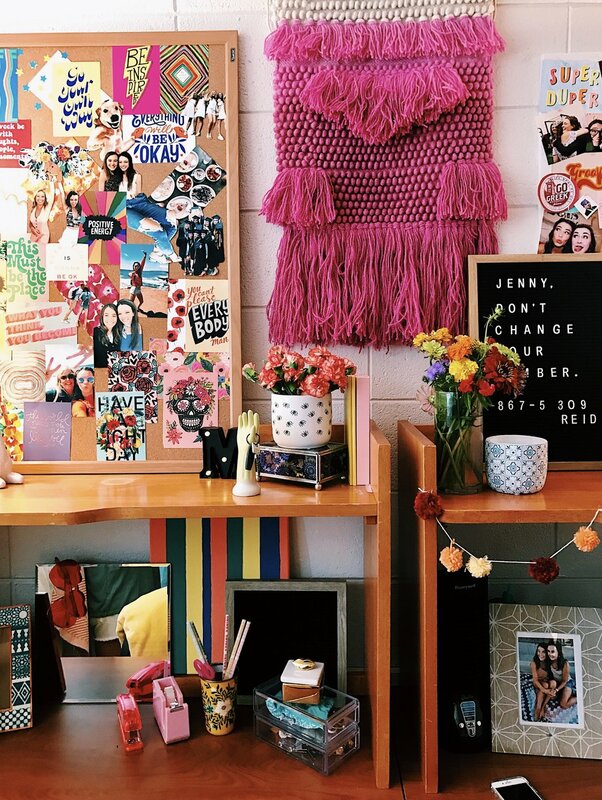 Two weeks have flown by living in my dorm & I haven't even blogged about it yet?! Crazy. I just finished my first official week of college, as well as Rush the week prior, and I'm finally getting the hang of things. Everything is so far, so GREAT and I can't wait to blog more about my college experience. HEADBOARDS // I bought them from girls who used them in their freshman dorm room, but recovered them with Target sheets (which we got the same set of sheets for our bedding). PILLOWS // So. Many! My favorite one is my Anthropologie Euro Sham that I found on sale for roughly $20 (my print is sold out, but linked here is a similar style in the same size). I have an extra pillow tucked in the back with a faux blue fur pillowcase from Target (only like $5!) along with my sheet-pillowcase. For throw pillows, I found some bargains! I mainly shopped at TJ Maxx, Marshall's, and Tuesday Morning- the yellow velour pillow is Calvin Klein from TJ Maxx, the pink embroidered pillow is from Marshall's, and the orangey pillow is from Tuesday Morning. The Mexican Embroidered pillowcase I bought at a market in San Antonio, TX but linked here a similiar one. BLANKETS // My white duvet cover is a cheap pompom-edged fnd off Amazon. My roommate and I also match our Magaschoni orange and white knit blankets at the foot of our beds from Marshall's. The yellow name-embroidered tassel blanket was a super cute graduation present. DESK DETAILS // First, my lamp! My lamp steals the spotlight in my eyes with its double feature of a nightlight base & starry cut outs. The extraaaa large bulletin board/mood board is just the right height leaned on top of my desks' top shelf. I printed majority of my *inspo* images off of Pinterest, you can follow me there ;). The square mirror I found at AtHome for super cheap, I like the simplicity of it and having an extra mirror when getting ready. I painted a canvas plain stripes of our primary colors and it turned out super cute- just a little extra splash of color. The little things spread out on my desk were found primarily at Marshall's or Target: like the giraffe planter, frames, transparent pink stapler, pink tape holder, plastic clear jewelry drawers (found in Target Dollar Section), & the letter board (which I have now turned into a holder for my necklaces!). EVERYTHING ELSE // The hot pink Macarme hanging in the middle of our wall was a super cheap, super good find at Marshall's for less than $20. The "Same Sun Shines On Us All" little yellow poster was a local find I've haved and loved for years. The little fur step stool was less than $20 at Burlington's and is majorly necessary for the rised beds. My bed skirt is a Wal-Mart find, surprisingly! It comes in a package of 3 panels that fit perfectly. The pompom strand across our window was found at that Target party section aisle, and I really love the red and white thread it's made with in between the poms. My roommate and I matched our curtains to cover our closets with a light blue shade. Lastly, our rug! Our rug was a last minute, Amazon purchase that ties all our colors, and all homey-fun vibes into one.